This attractive sedge is native to the stream banks of New Zealand. Its height is only 1 to 2 feet tall but its weeping leaves can reach up to 6 feet long in its native habitat. We can expect shorter growth here but it should be used in a spot to show off its pendulous quality, perhaps on a bank above the pond, in an elevated pot, or spilling over a wall. Full sun along the coast but needs shade inland. Plant where it will receive frequent irrigation; and expect it to reseed. The unusual 'brownish' coloring of this sedge along with the curling at the tips of the leaves makes this plant an outstanding addition to any garden. This New Zealand sedge has vertical growth of 1 to 2 feet and a light airy appearance that is useful in mass or as an accent. Plant in full sun to part shade. Useful at the edge of a water garden or in a drier location. Stunning planted with silver and gray foliage, especially in the sun which highlights its coppery-tones. This moisture loving plant will thrive in shallow water or rich moist soil. The 2 foot tall clumps with striking yellow foliage will brighten any spot and is beautiful when reflecting off of water. The newly emerging spring growth is outrageous and compensates for the faded look of this plant in late summer. Plant in full to half day sun. A narrow upright sedge to 12-14" inches tall. The plant forms extremely tight clumps, with finely textured leaves that have a dark green central stripe and a thin margin of pale yellow. Plant in full sun to light shade. Occasionally seedlings from this plant lack variegation. Although this name may not be valid this plant has been grown in California under this name for more than 15 years. We first grew this plant in 1988 as Carex species 'Variegated'. Our plants originally from John Greenlee. It is a name of dubious validity, however it will have to do until something more authoritative comes along. Cares flagellifera - Brown Sedge - A weeping, 2 to 3 foot tall reddish-brown sedge useful in mass plantings or as an accent plant. Looks great with succulents, red and blue colored plants, or as a container plant. Best in full sun to show off its color but will take part shade. Average garden water. Carex glauca - Blue Sedge - A beautiful silver-blue sedge growing only 6" tall. A moderately slow spreader in a low-water use garden but spreading quickly with ample water and fertilizer. A great ground cover that takes some traffic or it can be used directly in a water garden planted up to 2" below the water surface. Once established it has shown moderate drought resistance, especially in part shade; or plant in full sun with average garden water. Carex morrowii 'Variegata' - Silver variegated Japanese sedge - Clumping, evergreen sedge, with silver white variegation. Good for ground cover, rock gardens and mass plantings. Likes shady, moist places. 1-2 ft. tall by as wide. Hardy to about 0-20 degrees F. Very striking as an accent plant or groundcover. 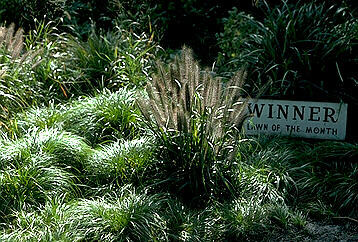 A short, rich green sedge selected by John Greenlee as an alternative to typical turf grass. Growing to 6-8 inches tall and spreading by rhizomes to form a carpet that tolerates moderate foot traffic. A good plant as a ground cover between and around stepping stones or patio blocks. Has a period of summer dormancy in warmer, drier climates. Tolerates full sun to partial shade. Moderate water requirements - lower than most lawn grasses. Hardy to at least 15 F. We received this sedge from John Greenlee as Carex pansa but later keyed the plant to the very closely related Carex praegracilis. We listed it under this name for several years but unfortunately the plant has been popularized as Carex pansa and we somewhat reluctantly are now going back to this name. Carex phyllacephala 'Sparkler'(C. 'Sparkler')- An evergreen upright growing sedge with broad yellowish-white variegation on thin grass-like leaves that rise up on narrow stems. Needs moist soil and full sun to partial shade. Grows to about 1-2 feet tall. Hardy to about 10 degrees F. Very showy. Carex retroflexa var. texensis - Catlin Sedge - A cute little clump forming sedge with foliage generally reaching no taller than 4 inches. Plant in very shallow water, along the edge or in pots. This sedge need not be restricted to wet areas: it can be used as a groundcover lawn substitute. Carex solandri - New Zealand Forest Sedge - A very nice fine textured dark green sedge to 1 foot tall. Excellent as a groundcover, even within paths. Very much like Carex tumulicola but smaller. Will reseed within the garden but not a nuisance. Carex spissa - San Diego Sedge - An attractive silver-grey clump forming plant whose native range extends from Baja California north to San Luis Obispo. This sedge, if given the optimum conditions of full sun and ample water can reach 4-5 ft. tall. In the sping the yellow flower spikes emerge above the leaves and age to tan during the summer. Plant in full sun or light shade (where foliage color is richer) and in or out of water. This sedge can withstand considerable dryness once established. Carex subfusca (C. teneraeformis)- Rusty Sedge - Native Sedge that has a wide distributiuon throughout the western US from the sea to the desert - generally found in seasonally wet meadows and creek beds. It has a narrow vertically held dark green leaves to 8-12 inches tall and spreads by rhizomes to form dense stands. It is recommended for full sun with regular to occasional irrigation but we have found it very tolerant of shade and considerable drought in our own planting at the nursery. A great meadow copmponent. Control spread with barriers or irrigation practices. As with many of the Carex there is some confusion about this name. Plants described as C. teneraeformis are currently now considered to be C. subfusca as well. Our plants from the Santa Barbara Botanic Garden Plant Introduction Program. Carex testacea - Orange Sedge - A clumping fine-textured sedge growing 1 1/2 to 2 feet tall with leaves that arch outward up to 2 feet. Its unusual orange color keeps best in full sun and in moist soil. Plant this plant where its weeping quality will be shown, spilling over walls or rocks, or directly in the water garden. Carex tumulicola - Berkeley Sedge - This lush green sedge is one of the best plants for creating a natural meadow look, growing to 2 feet tall and as wide. Berkeley Sedge will grow in moderately dry conditions but can also be planted in wet soil or in shallow water, and can be planted in full sun or shade - good as an understory planting. Cut the foliage back once or twice a year to clean up older growth and prevent it from seeding out.